After being conceived by LG last year, the G2 launched with Android Jelly Bean under its belt, which was the latest at the time. Now that some time has passed and all the tests have been done the G2 has had the pleasure of receiving the latest Android on the block – KitKat – and among other optimizations we expected LG to have tweaked and improved the battery performance. A software update cannot increase the capacity of the G2′s 3,000 mAh unit but it could do wonders for the way it’s consumed. Previously, the G2 had some excellent numbers in all three of our tests – calling, browsing and watching video. The stand by time was bad, though and it meant the G2 had to settle for the good, but not great 62 hour endurance rating. Let’s see what’s changed. Talk time has seen a mild increase of 14 minutes for a total of an excellent 25:15 hours, which easily scores in the top 10 of our list. So an improvement to an already great score. Web browsing endurance has also been enhanced. The LG G2 scored 11:22 hours and now tops that with 11:42 hours. Again a top 10 score and one that improves on those of close rivals like the Galaxy S5 (9:36h), HTC One (M8) (9:06h) and others. Even the G Pro 2 was outdone. Finally, video watching wasn’t quite as nice a surprise. 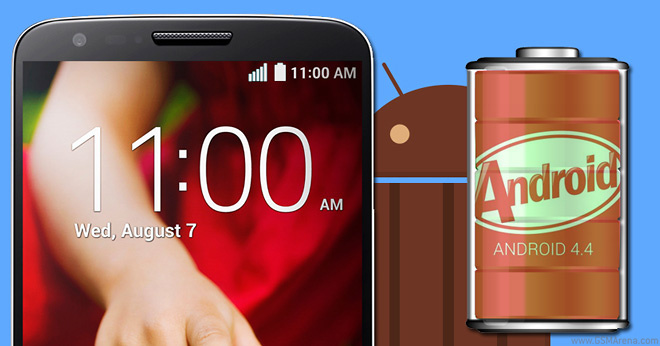 The LG G2 with Jelly Bean lasted almost 12 hours of video runtime, while the KitKat version was able to score 9:28 hours – significantly lower. In comparison the Galaxy S5 scored a much higher 11:05 hours, similarly with the One (M8)’s 11:14 hours. Still enough to get you through a long commute, journey, or just boring idle time. As we said, stand by was the deal breaker in the Jelly Bean days, but now LG was able to fix the issue. 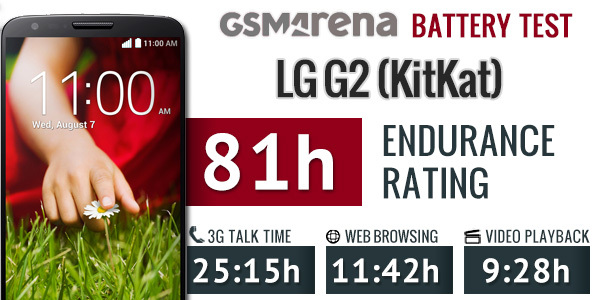 On KitKat the G2 scored a much higher 81 hour endurance rating. This is the interval between charges if you perform and hour of calling, browsing and video viewing every day. The number stands very impressive indeed and puts the LG G2 (KitKat) in the top 10 of our list on equal footing with the likes of the HTC One Max, HTC Butterfly S and Huawei Ascend Mate – all devices with bigger batteries. You can find more information on our testing procedure along with the full list of tested devices here.